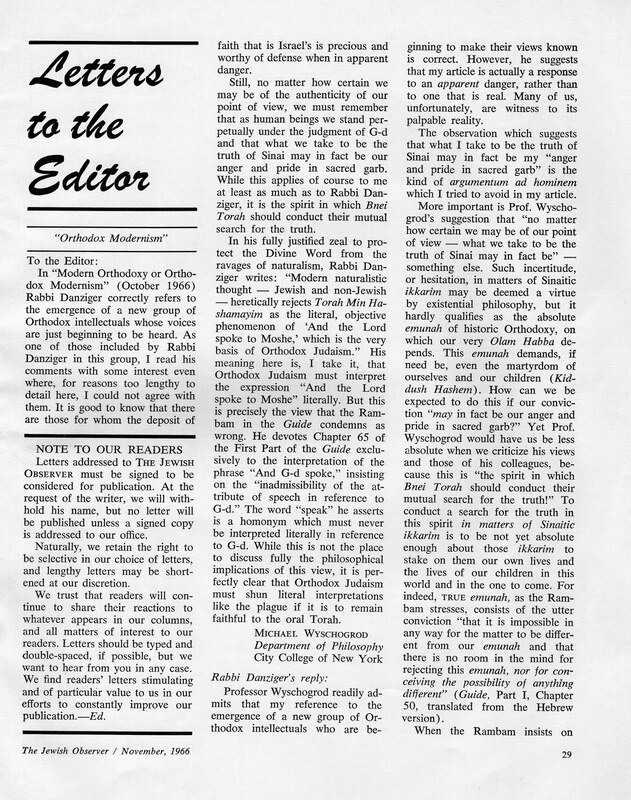 I was asked to comment on marei mekomos compiled by a well-known lecturer in Ohr Somayach-Yerushalayim, by means of which he asserts that it is demonstrated that there is a a concept of psak in matters of “Hashkafah” – more precisely, in matters of Aggadah. I address these sources in order, below, in a response to an email. I only address the first few references, because by then you'll get the drift! 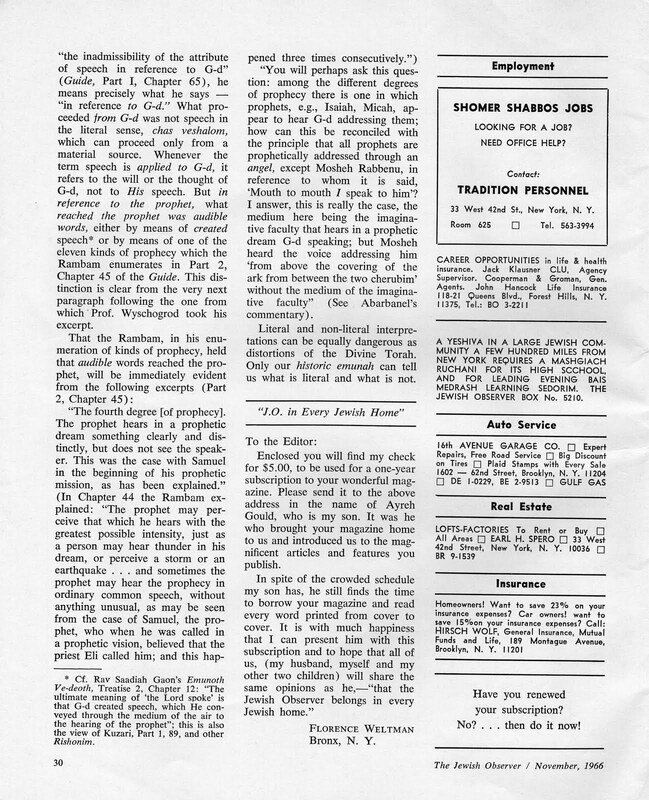 This source is not relevant, it is an issue of Hilchasa l'Meshichah – the question there is a halachic one, as to whether Eliyahu will be metaher mamzerim or not. True, it is a halacha that is not currently relevant – but it a halachic issue. see Kid. 36a "banim atem" the Rashba paskens halacha k'rebbi Meir. And see Har Tzvi and Torah Temima in Shas Lublin. The Rashba is in the Teshuvos 1:194. He is discussing the question of whether a meshumad is metamei b'ohel like a regular Yisroel or not. He mentions that “according to R' Meir he is also included in banim.” This is not meant to be the basis of the psak. It is only mentioning a point of fact, that according to R' Meir he is included in banim. Again, I don't know to what this reference refers. meshech chochma emor "raui"
Again, I don't know to what this reference refers. [note many cases where tanaim dispute "hashkafa" questions e.g. Sota symbolism] The three cases mentioned by Rabbi Kaplan: Peirush hamishna Sota 2:5 - when mayim bodek - machlokes R Meir, R Akiva [so they definately did pasken] and Rambam says Hashem knows; 3:3 - hashkafa v'dea without maaseh, ain lomar halacha k'ploni. See Mishna Torah 3: 16, 3:20 - he does pasken! This is a distortion of the Peirush HaMishnayos. All the Rambam says is that the waters can check for future licentious behavior, if that is their intent, because Hashem knows the future! What the Rambam here does is give us a narrative of the course of events in the case of a Sotah being checked by the waters. It is not a psak. Not everything in Mishneh Torah is a psak! Rather, to give us the gist of the idea of what does and does not happen in the course of the procedure, the Rambam gives us as broad and encompassing an overview as possible. If anyone has any specific difficulties with the references cited below, please let me know and I will try to deal with them. See Shavuous 1:4 - kaparas hamusafim - it is Divine management, and since it is not l'maaseh we will not pasken. Hil Shavuous 11:9 he does pasken. Sefer Hamitzvos lo saaseh 133 zar she achal teruma misa bidei shamayim: limitation only not to pasken when there is no nafka mina l'maaseh - is that his limitation? - the Gemora clearly is paskening. But in Mishna Torah he does pasken: Terumos perek 6:6. Moreh II:29 - we do not accept the age of the world 6000 because it is a daas yachid . III:17 Also paskens yesh yisurim bli avon....i.e. He paskens against yisurim shel ahava - he says "a few of the chachamim" - presumably the authority for rejecting is that they are a minority. Also see his letter on astrology: It is appropriate to believe only three types of things: something proved by man's intellect, like calculation, geometry or astronomical periods; something perceived by the senses directly and immediately; something received from the prophets and the tzadikim!! Notice that there is no room here for theoretical science at all, certainly not "historical" sciences. ...all astrology is nonsense...and I know that you can search and find individuals among the chachomim of the Talmud and Midrash that their words show that at the time of birth the stars will cause etc. 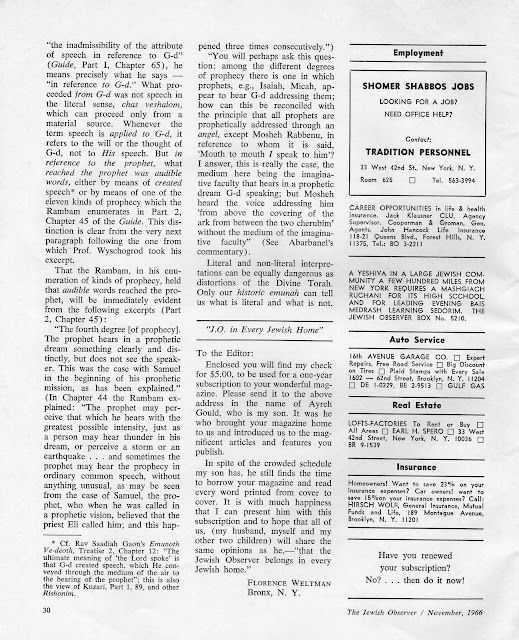 Do not be troubled [by those statements] for it is not appropriate for one to abandon halacha l'maaseh and search out objections and answers; and it is not appropriate to abandon matters of daas that have been demonstrated with proofs and wipe his hands of them and rely upon an individual of the chachomim - that indivudal may have missed something, or his statement was not meant literally, or he said it only about his time or the particular event with which he was dealing. [We see here that the Rambam felt he had to square himself with the chachomim - if he did not have the authority to oppose them he would have to agree. And that authority includes the fact that the authors of the statements are individuals. *Do you not know that there are verses that [their true meaning is] not according to their peshat? **And since we know with proofs of daas that it is impossible for them to be according their peshat, Onkelos translated them in a way that daas can accept. A person should never abandon his daas.... [It seems that * is a reason for taking the statement of the individual chachom that seemed to endorse astrololgy figuratively - for even verses are sometimes taken figuratively.... ** Explains that in those cases the translation was chosen to agree with daas. Is there an impoication that the opposition of daas alone justifies rejecting the peshat? And even if so - how much does daas include? If it includes contradiction with other verese [as in Guide ] then we are not opposing logic to Torah. And this agrees with his use above of other reaons together with logic to oppose the statements of chochomim that seem to support astrology.] [It is not clear exactly how his different counter arguments are related - all are necessary only only some; how much does the fact of having proofs to his position weigh.....]]. Moshiach comes or not - Rambam paskens bec it is ikar of emuna. And he paskens in peirush hamishnayos. So nafka mina l'maaseh includes belief [But see end of 13 ikarim - also nafka mina in how we treat him.] Was the tana who said no moshiach a kofer? No - prior to psak there is not such guilt - Reb Chaim [though he was objectively wrong]. See Abarbenal Rosh Amana chap 14 - it is not a machlokes at all - he meant something else. Megaleh panim she lo k'halacha -ain lo chelek but not in defintion of kofer. So responsibility of belief goes beyond def of kofer. Nafka mina of kofer is being member of klal Yisroel [see end of 13 ikarim in peirush to San chap 10] - the ikarim define kofer, but does not exhaust reponsibilities of belief. Megaleh panim - def: San 99b - hagada shel dofi [Mishna - Hil teshuva - 3 all emuna cases of no chelek vioalate one ofthe 13 ikarim. Peirush hamishna Avos [megaleh panim] 3:11 - Rambam - azus in action davka. But others take it as hagadah shel dofi [she lo k'halacha means "improperly" - not "against the halacha" [Rashba - hagada shel dofi includes allegorizing wrongly - implication that the peshat is trivial or wrong: that IS the attitude of contempt] - attitude of contempt can cost olam haba. Compare hil talmud Torah, tushava 9, and ultimately Guide III:51. MP - hilchasa l'meshicha is a reaons in the Gemora not to paskan, but Rambam does pasken them in M.T. He is writing halacha for the times of mashiach. The Gemora seems to be objecting that if there is no need for a psak = no nafka mina l'maaseh, why pasken? But in m.t since he is writing for yemos hamoshiach, there is a nfka mina l'maaseh for that time, so he paskens. Please join us to discuss how we can convince the Agudath Israel of America to bring The Jewish Observer back into print. Even if you don't have any ideas to share, your joining the group is tantamount to signing a petition to see the JO brought back to life! 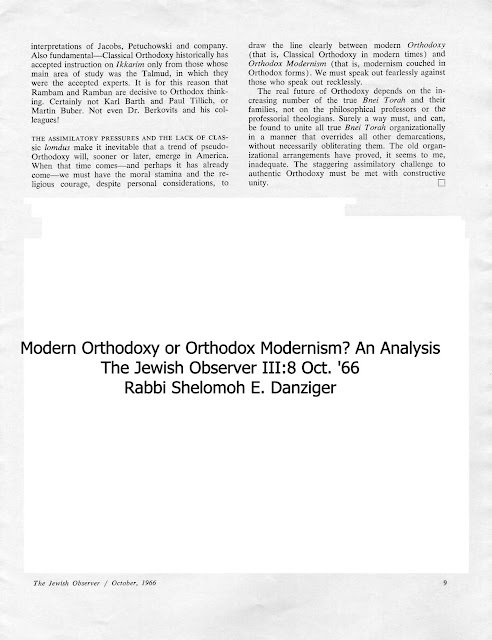 Rabbi Shelomoh E. Danziger shlita's dichotomy is even more relevant today than in was in 1966. His debate with Prof. Wyschogrod demands re-examination! 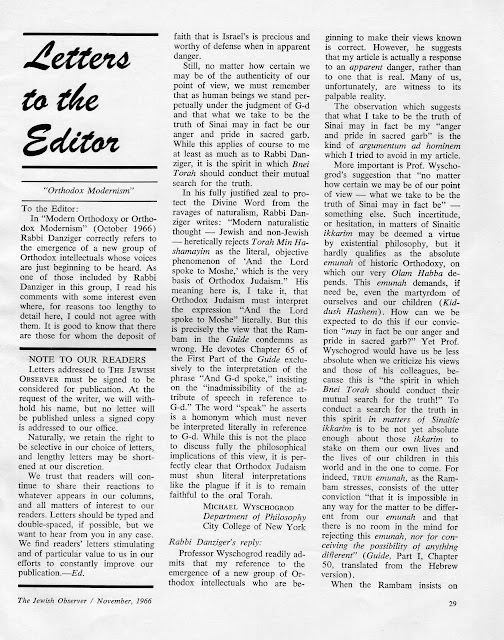 Note and Request: Please join us our new Google Group to discuss how we can convince the Agudath Israel of America to bring The Jewish Observer back into print. Even if you don't have any ideas to share, your joining the group is tantamount to signing a petition to see the JO brought back to life!